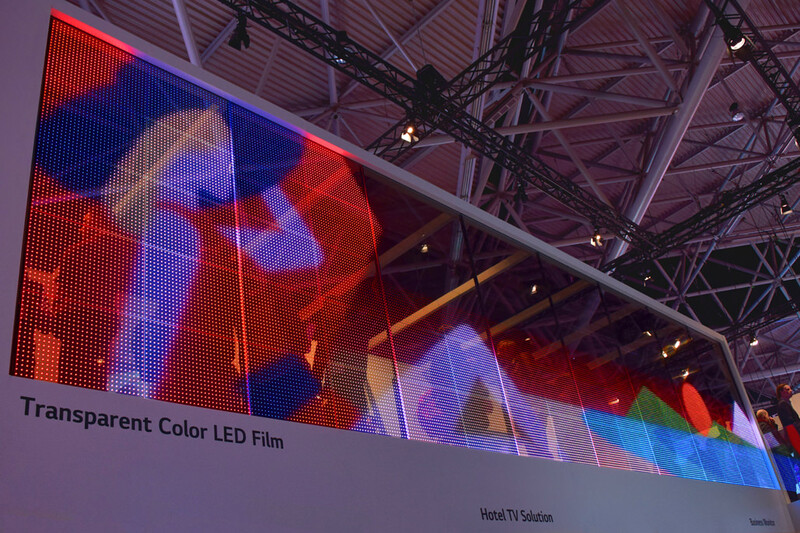 LG’s transparent OLED signage steals the show at ISE 2018. Digital video signage at Cinos. 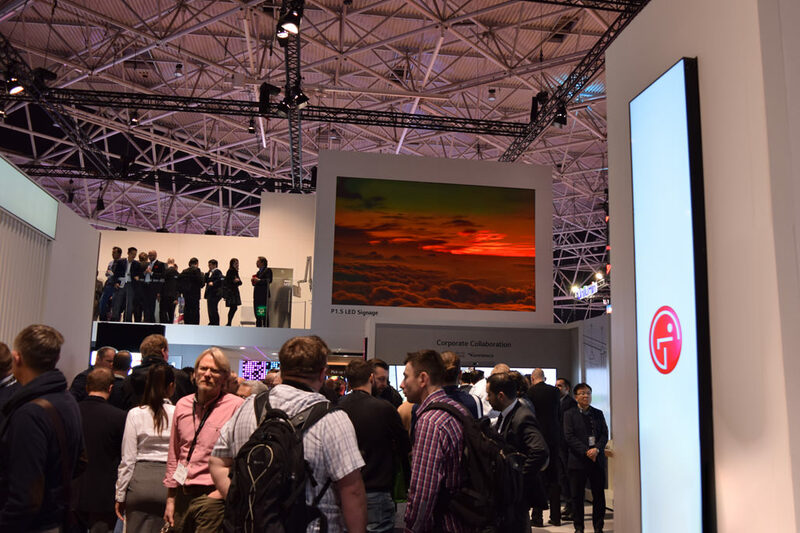 Visiting the LG stand is always one of the highlights of ISE and 2018 did not disappoint. 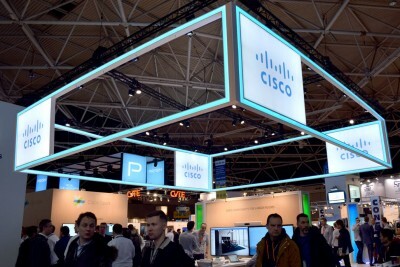 Each year we see a range of innovative, eye-catching solutions that really bring the ‘wow’ factor to ISE. We caught up with Peter Mytton Bayley on the stand and extended our congratulations as the winner of the ‘AV support professional of the year’ at the AV News Awards. Well done Pete! The stand itself saw a constant flow of traffic, partly down to the breath-taking Canyon Attractor located at the entrance. This futuristic solution is comprised of 60 Open Frame OLED displays in convex and concave configurations. Ideal for large scale video installations, the Canyon Attractor can be tailored for multiple uses across any vertical thanks to their customisable form factor and outstanding image quality. With the ability for these displays to fit any area or contours in a commercial space, this fantastic OLED solution is something we look forward to specifying for upcoming projects. 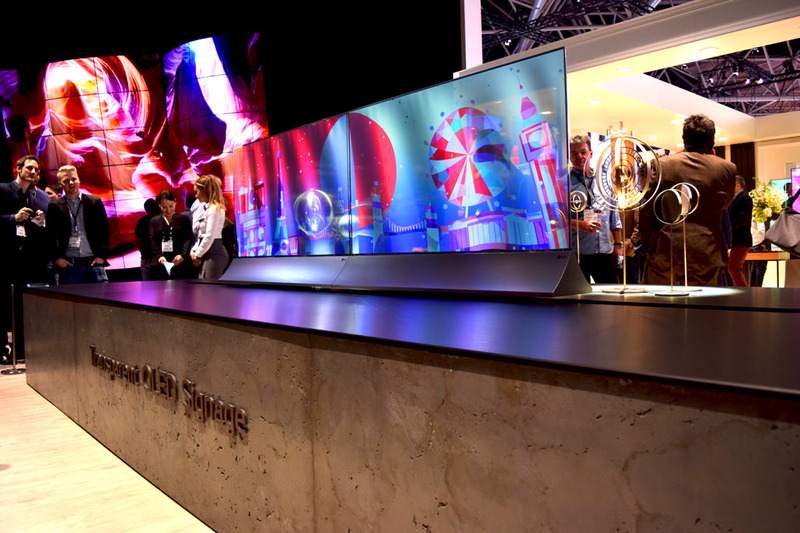 The centrepiece of the LG stand was their 55inch OLED signage; a truly stunning solution which won the ‘Display Technology for Digital Signage’ at the InAVation awards. Not only does this display boast razor-thin bezels and an elegant form factor, the real attraction is its transparent OLED display. Ideal for retail, art galleries and museums, organisations can place products behind video or special effects played on the display; really catching the attention of passers-by. If you are looking at LG solutions and would like to discuss your requirement please get in touch. We would be happy to help. As we continued our stand tour we were shown how LG’s advanced signage solutions have been extended to the transportation industry. Their flight information display systems (FIDS) are available in a wide range of sizes and orientations and offer an advanced anti-reflection features to ensure passengers can see their information at a glance, without distractions. 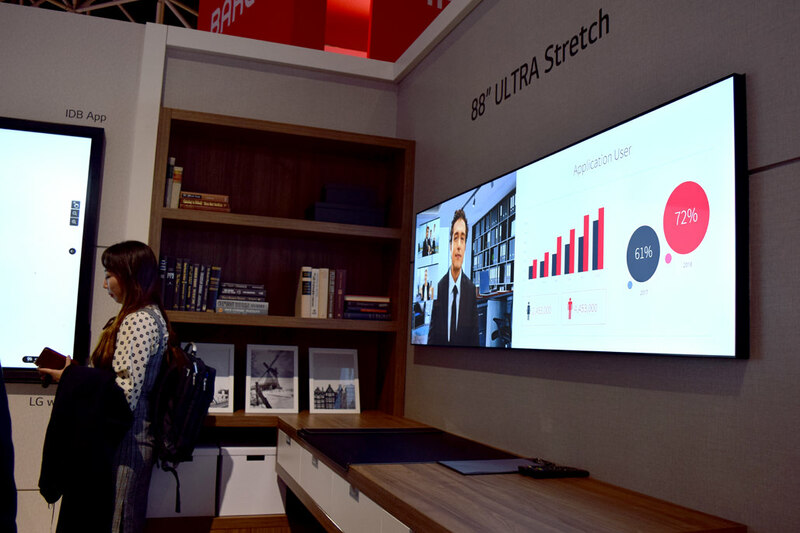 Furthermore, LG’s 86- and 88in Ultra Stretch display can be used in conjunction with the FIDS, displaying directional information and customer notices in multiple foreign languages. 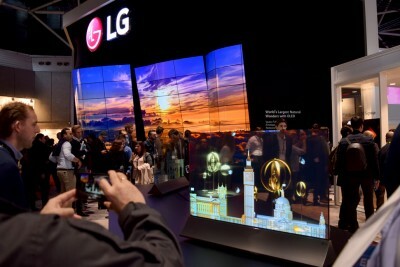 Onto video walls and LG’s products were nothing short of impressive. 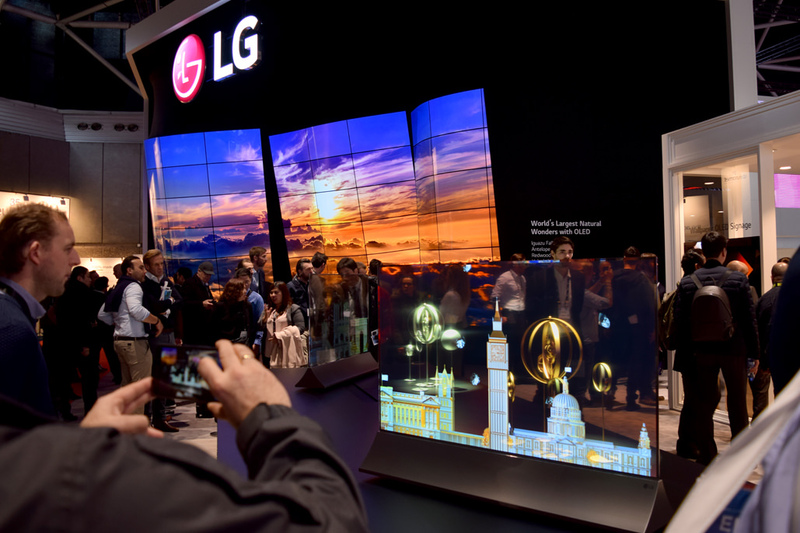 Their 0.6mm-thin Even Bezel Video Wall delivers a truly immersive viewing experience. The ultra-narrow bezels minimise distractions to offer seamless image quality; ideal for advertising high-end products. 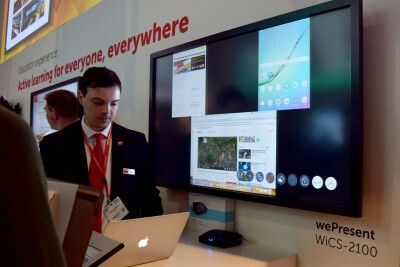 For spaces with high luminance, LG were showcasing their digital signage video wall capable of delivering 1,500 nits of brightness which delivered remarkably clear and bright images. With so much to take in on the stand it is impossible to mention all the highlights. 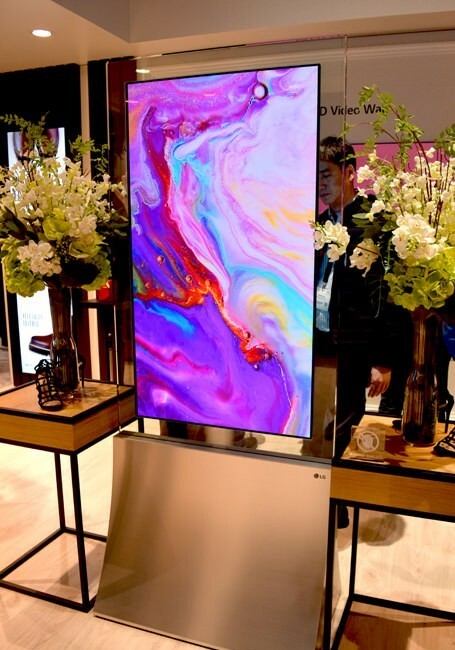 Whether it was the award-winning OLED Wallpaper TV for hotels or the transparent LED film, the LG stand really brought the ‘wow’ factor to ISE. 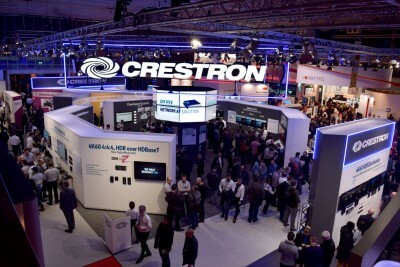 If you are looking at LG solutions or saw something at ISE 2018 you would like to discuss further, please get in touch with our team. As an LG Partner we are perfectly placed to discuss your requirements.